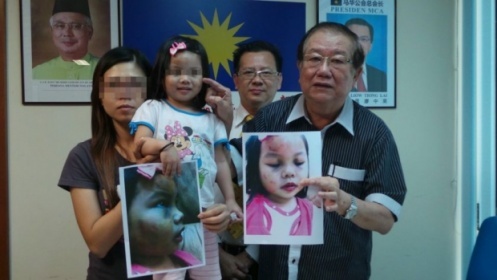 KUALA LUMPUR, May 8 — Chan Yee Ling, 30, was giving her two-year-old daughter Tan Xuan Ying a bath when she saw bruises on her child’s face. “Cosmetic concealer was used to cover up the bruises,” she said, recalling her horror on Monday after bringing her daughter home from the babysitter. Chan said she asked the babysitter what had happened and was told that her daughter had fallen. She lodged a report at Cheras police station on Tuesday morning and took her daughter to the hospital for treatment. Chan met the 34-year-old babysitter on Facebook and hired her on March 1 to take care of Xuan Ying and her one-year-old brother for RM1,700 a month, excluding food. The babysitter, who lives in Kuchai Lama, is married and has a four-year-old daughter. Chan, a single mother working as a sales executive, sends her children to the babysitter every fortnight and would visit them on alternate days. The babysitter discouraged Chan from visiting her children too often as it would be hard for them to adjust. “I was shocked to find my daughter in that condition. I have a good relationship with the babysitter. Sometimes I even have my dinner there,” she said at a press conference with MCA Public Services and Complaints Department head Datuk Seri Michael Chong. Chong advised parents to be more careful when entrusting their children to babysitters. “Be careful when you look for a babysitter, especially on Facebook, as it is difficult to run a background check. No formal licence is required for babysitters,” he said. Chong said they would decide the next course of action with the help of his legal team. Last month, a six-month-old boy died from head injuries believed to have been sustained while under the supervision of a babysitter his parents had found on Facebook.